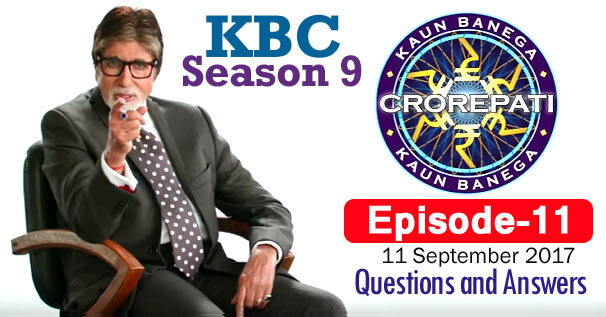 KBC Season 9 Episode 11 Questions and Answers: The eleventh episode of Season 9 of Kaun Banega Crorepati (KBC) was telecast on 11th September 2017. In which Amitabh Bachchan had asked contestants 18 questions of General Knowledge. The correct answer to all the questions is given below each question. By reading these questions, you can prepare yourself for the next KBC Season 10 of Kaun Banega Crorepati. Because by reading these questions, you will understand what kind of questions asks Amitabh Bachchan in KBC. These all general knowledge questions will be helpful to for you various Competitive Examinations and Interviews besides KBC. Remember, the answer to some question may be in accordance with that time, while the answer to those question may differ according to the present time. 1. Starting from January, arrange these tennis grand slams in order in what these are held in a year. 2. The mirror image of which of these numbers written in English numerals, remains unchanged ? 3. Identify the Voice ? 4. Which one of these names of Lord Vishnu is derived from the Sanskrit for 'lotus' ? 5. What rank in the Indian Air Force is equivalent to a major in the Indian Army ? 6. Which of these aquatic animals is a mammal ? 7. Which international airport in India became the first in the world to operate completely on solar power ? 8. Which sport returned to the 2016 Rio Olympics after a gap of 112 years? 10. Which of the following sweets contains milk as one of its main ingredients? 11. Which of these Hindi words is not related to fire? 13. Which of these is the last in number? 14. In the 'Don' films, which character was the lookalike of Don? 15. Which of these political figures has not served in any of the Indian armed forces? 16. Which of these rivers only flows inside Indian territory? 17. Which of these big cats does not have the ability to produce a full-throated roar?